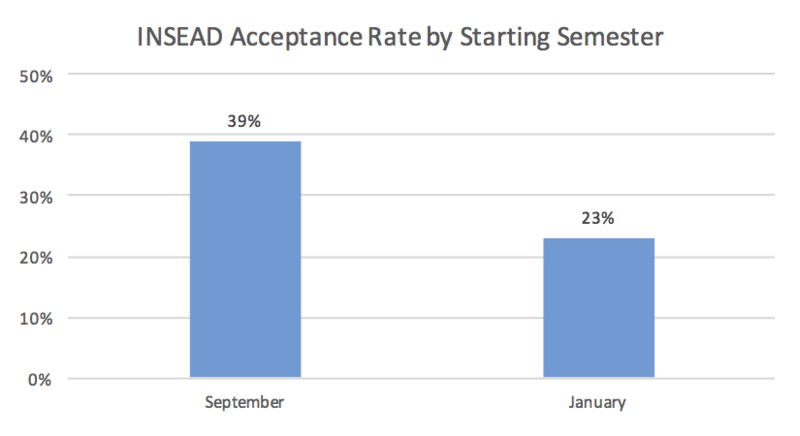 This article will analyze the model I built to predict INSEAD acceptance rate. INSEAD is a graduate business school in France, near Paris. It has two additional campuses in Singapore and Abu Dhabi. In addition to the MBA program, INSEAD also has an Executive MBA, Masters in Finance and a PHD in Management. Unlike most business schools in the US, INSEAD’s full-time program only offers a 1-year MBA. INSEAD students can either start in September or January. The January start is a 12-month program for students who would like to do an internship. The September start is a 10-month program. INSEAD prides itself on being a global business school, thus, it requires applicants to speak two languages fluently before being admitted. In order for a student to graduate, they must speak three languages. On average, INSEAD MBA acceptance rate is 31%. The average GMAT is 703 and the average GPA is 3.5. Similar to Columbia, INSEAD has two start options. Since many MBAs are hoping to use their MBA to transition into a new industry, there is much more competition for the January start because it allows for an internship during the summer. Since fewer people apply for the September starting semester, their chance of admission is 70% higher than that of the January applicants. 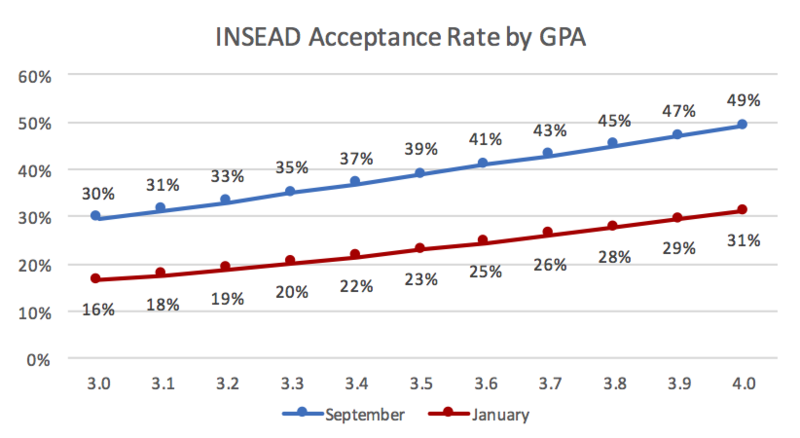 September INSEAD applicants have a 39% acceptance rate compared to only 23% for January applicants. 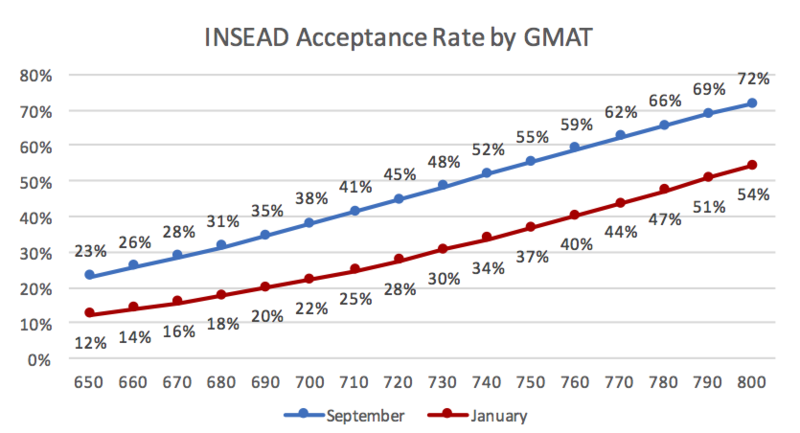 GMAT has a large impact on an applicant’s chance of admission at INSEAD. It is especially important for those applying for January. A 100-point increase from 650 to 750 would raise January acceptance rate from 12% to 37%, which is a 208% increase in chance of admission. A similar increase in GMAT for a September applicant would only increase chance of admission by 140%. A high GPA can increase your odds of getting into INSEAD. Both start semesters get a healthy boost in chance of admission from a high GPA. Interestingly, a January applicant with a 4.0 has a similar acceptance rate, at 30%, as a September applicant with a 3.0. Although both GMAT and GPA are both important for admission into INSEAD, GMAT is more important. Getting a high GPA (one standard deviation above average) will increase chance of admission 5%. However, a high GMAT will increase your chance of admission by 13%. Citizenship has a significant impact on INSEAD acceptance rate. Indian applicants face tough competition for a spot as an MBA student at INSEAD. Indian applicants have an acceptance rate of only 12%. 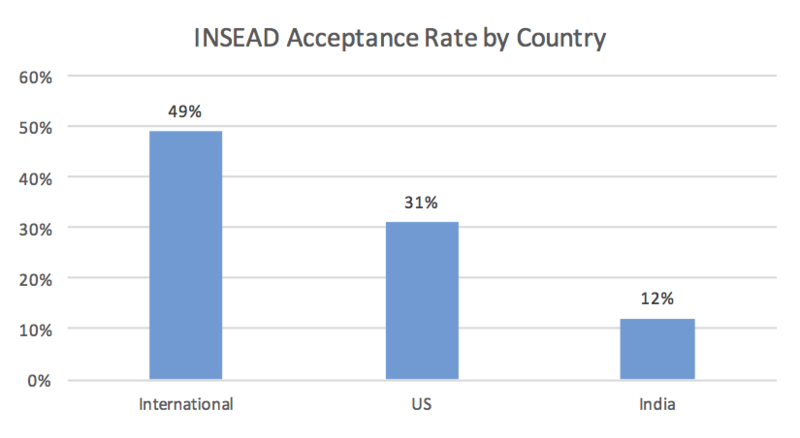 Admission to INSEAD is much easier for Americans, with an average acceptance rate of 31%. No other country had enough applicants to be statistically significant, so I grouped all other countries into the category of “International”, which had an acceptance rate of 49%. The data I used to create the INSEAD model came from GMAT Club. I have the model built for the calculator, I just have not loaded it onto the calculator. It will eventually be on the website. Great piece! I was wondering where you got the GPA figures from. 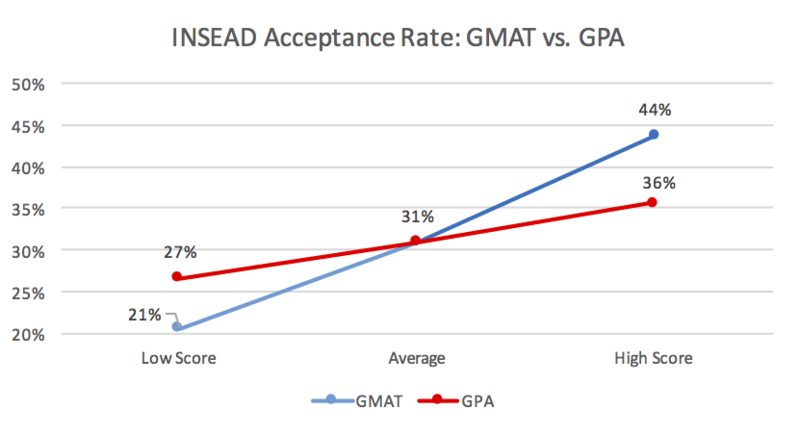 I know they are from GMAT club, but from my understanding, most of INSEAD’s applicants come from undergraduate institutions in Europe and Asia (which do not necessarily have a GPA system out of 4.0). Were your GPA figures taken from North Anerican applicants only? Thanks. They were self reported GPAs. Unfortunately the data is on my other computer so I can’t check. Great article! I noticed some of the other schools have interview acceptance rates in their analysis. Is there anything you can say about the interview-stage acceptance rate? Is it significantly higher than the general acceptance rate or do they nearly interview everyone that applies? Any thoughts on the work experience and its impact on the acceptance rates? Hey! I love your site! Very informative. I have a question, unrelated to INSEAD. I have a 3.4 GPA from Northwestern (but I was an English major), 3 years of work experience at a small real estate company in Pittsburgh, and I should get roughly a 700-720 GMAT. 25 years old. How much will I be handicapped for being an English major and not, say, a Business/Economics major? 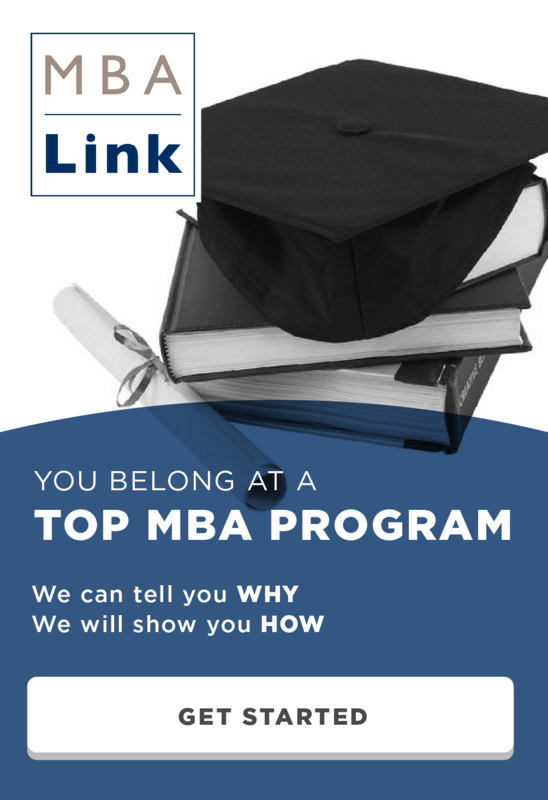 Do I still have a shot at top 25 MBA programs? Also, my buddy is in a similar boat (3.5ish GPA at Georgetown but as a History major). He has 3 years of work experience, too, but as a tutor. Will he be handicapped for not having business experience by top 25 MBAs)? History vs other major does not affect stats, only GMAT and GPA impact those. Expected compensation post MBA could also be a factor so the industry you say you are interested in could impact your chance of admission. The potential problem with an English or History major is that there is likely little to nothing in their resume to demonstrate that you will be able to handle the analytical rigor of an MBA. The best way to address this to to get a high GMAT, especially in the quant section. Other ways to address this would be to get a pre-MBA job in an analytical field and do well or to take a few quant heavy grad classes before applying and get a high GPA. The high GMAT in the quant section is the best because it helps their stats and shows that you can do math at the same time. Its been nearly 5 months now, since your last comment. Hopefully by now, you have located your “other computer”. Without disclosing your source of information, you analysis, lacks credibility. If you think that my analysis lacks credibility, then you are welcome to your opinion. It seems that you think that because I don’t have a lot of time for this site anymore somehow that diminishes the quality of my previous work. It sounds like you think that I am lying about having two computers and that I am trying to hide something and that is why I rarely respond to comments or post new content. I actually have 5 computers: 2007 MacBook Pro, a horrific HP laptop from 2014, 2015 Macbook Air, 2016 Macbook Pro and the ThinkPad my company gave me 8 months ago. Most of my previous work is on the Macbook Air I used during school. I am a consultant (MBB) and it is tough to carry two computers when traveling, so I only carry my ThinkPad when I am on the road Monday to Thursday. On the weekend I prefer to spend time with lovely fiance instead of working the this website. On occasion I have some time while I am on the road to work on the website but unfortunately all of the old code and Excel files are on my personal computer. The good news is that over the past several months I have been working on Python code which automates a lot of the tedious work I had to do to analyze MBA admission data (mainly cleaning the data). I have used this code to collect all of the data for the top 25 schools for the past 5 years and clean it. I am actually working on some awesome new articles which will be published soon. I am also working on some substantial upgrades to the website, so adding one school to the calculator is not really on my radar. I hope to roll out some of these upgrades in the next couple weeks. This is not my day job and I make no money off of this website so it is not my priority. I give the ad space to a friend for free, so I am really just doing this for fun because I am a nerd and I enjoy it when I have some free time. Best of luck with your applications and if you are patient then I should be publishing a lot of new content in the near future now that I have gotten over the hard part of getting the new data. Since this was on my mind, I just got home and grabbed my computer. I really don’t have the energy or interest to write the code to add this to the calculator now but if you know anything about logistic regression then you can use this to calculate your own chance. Note: Start_Month = 1 if September start. If applying as an Indian the India = 1. If not US or Indian then International = 1. Age_Dev = absolute value of 27.5 – your age. Age_Dev -0.118312 0.066559 -1.778 0.075478 . *Sorry but apparently the formatting got messed up. Hi Data Guru, thanks for the analysis. Where are you getting this data from? I get the data from GMAT Club. I am confused between applying to round 4 for Jan or Round 1 for Sep. Is it possible to discuss privately and hear your opinion based on your data and experience of this? First and foremost, thank you for the great analyses. I read several of your posts and I notice the low acceptance rates for Indians pretty much all across the board, which is contradictory to their solid presence in almost all programs in the US and UK especially. Do you think the lower rates are due to the large volume of applicants who are Indian? I’m not Indian, I just want to contribute in maybe developing a more sensitive and accurate model. There is just a huge volume of applicants from India. My data indicates that there are roughly 5x more Indian applicants as Chinese applicants despite the countries being the same size.